As part of a series of our #TravelThursday blog posts highlighting the independent sprirt of Dorking, Notallaboutskinny co-founder Kate is back with the skinny on Christmas in Dorking. Kate is a Precision Nutrition Level 1 Certified Coach and Dorking local. Kate has just returned from a year traveling around the world. The White Horse is a quirky place with a vibrant and rich history, much like our town itself. It was listed in the Domesday Book as belonging to William the Conqueror and served as a staging post for soldiers before becoming a prominent coaching inn and hub for the South East of England. Over time, it has has hosted esteemed guests such as Benjamin Disraeli, Daniel Defoe, and Charles Dickens. In fact, Dickens stayed at the White Horse for seven months and it’s believed that he wrote most of his first novel, The Pickwick Papers, during this period. When Mr W and I left Dorking in 2017 for our “Grown-Up Gap Year”, The White Horse was just about to undergo a £4m refurbishment. It was tired and in desperate need of some serious TLC. When we returned this summer, we were delighted to see that it had been lovingly given a new lease of life and now sits nestled like the jewel in the crown of our bustling market town. There’s a wonderfully relaxed vibe to the place and they’re incredibly proud of the fact that it’s a dog friendly pub (as featured in the ‘Pets Pyjamas’ travel website, no less). There are even jars of dog treats scattered around the lounges! After a long walk in the surrounding Surrey Hills, you’re more than welcome to bring your dog to Sunday lunch … and if you’re really lucky, you’ll get to meet Womble, the most beautiful Leonberger who you’ll spot dutifully following his owner, the manager Beccy, around. I defy you not to fall in love at first sight. One of my favourite things about The White Horse is the fact that it offers so much. Pop in for a coffee or a drink, a light snack or a full meal, a special occasion or just a mid-week meal out, this place has it all. The Dozen Deli is packed with treats which showcase Surrey’s finest produce including honey, chutneys, cheeses, local ales and wines. Their restaurant, The Dozen, serves everything from breakfast, brunch and lunch, to afternoon tea, coffee and cakes and a full restaurant menu of British and European classics. Fish and chips, seasonal pies, steaks and sea bass all accompanied by a very reasonably priced wine list which include some of our finest local fizzes. Mr W and I took advantage of their current offer and weren’t disappointed. £69 for a bottle of Malbec, a Surrey farmed Cote de Boeuf, potatoes, sides and a choice of sauces. Boom! There’s your Saturday night sorted. My favourite spot is to snag one of the cosy tables for 2 in the elegant bar area. 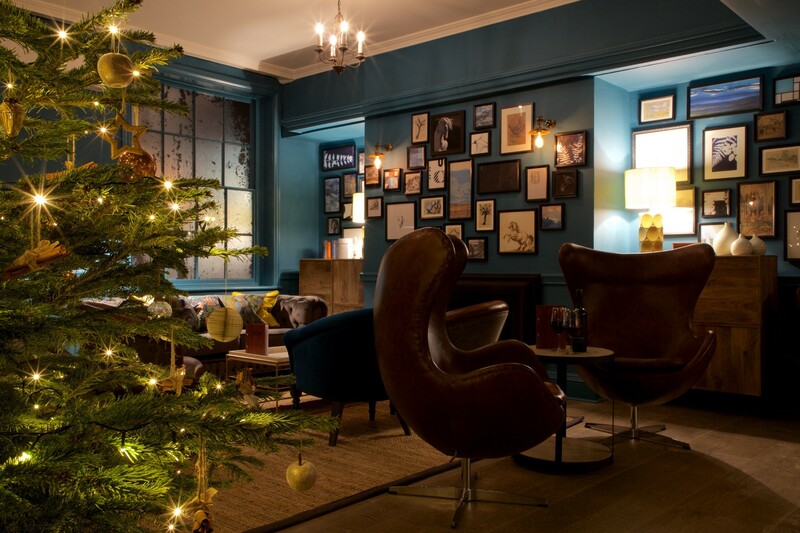 It feels like a classy Gentleman’s club; big leather chairs, inky blue walls, mood lighting and a fabulous range of Dickensian themed and locally inspired cocktails — be sure to try the Albury Equestrian, a delicious fizzy, gingery twist on a Moscow Mule made with Silent Pool Gin, distilled just a few miles away. There are also lots of little nooks and crannies where you can hunker down for the night in a giant comfy sofas by a crackling log fire. This is the first Christmas for the new-look White Horse and sales manager Isabel tells me that they are really excited about it. “We feel so settled here now” she says, “and I think we’ve achieved our aim of making The White Horse a truly special place to visit”. I’d wholeheartedly agree and it’s great to be able to recommend a fantastic place to stay when we have friends from afar visiting our home town. 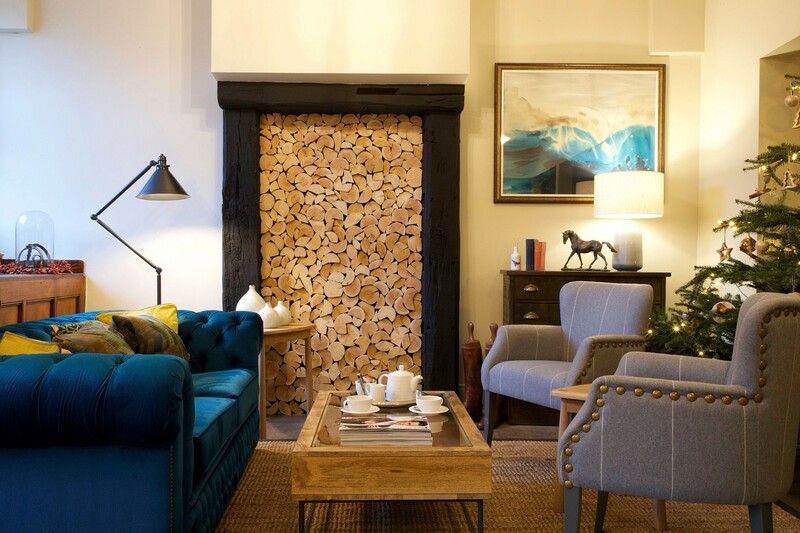 As part of the Bespoke Hotels group, you can expect smart, well-equipped, comfy rooms and if you’re visiting for a special occasion there’s a decadent suite with a giant, squashy bed, free standing bath and vast walk in shower. Isabel says that they wanted to achieve what she calls, “the slipper effect”, the kind of place where you feel at home and can truly relax. As I sip my big mug of locally roasted coffee and enjoy a freshly baked croissant (yes, there is pastry absolutely everywhere), I’m pretty confident they’ve achieved it. I could happily stay here all day reading the paper and watching the world go by! As you’d expect, there are a range of packages for meals and stays which include drinks, dinner and wine tasting at the nearby Denbies Vineyard, and also some fun packages for the children with days out at Bockett’s Farm. If you’re thinking of booking for Christmas, better hurry up, as it’s almost fully booked. The new menu looks delicious and I ask Isabel about the White Horse’s plans for New Year. In truth, I’m not a huge fan of New Year and I know many others who feel the same way and so I was thrilled to learn that it’s going to be a quiet one. “We’ll be a place to come for a delicious dinner. We wanted to offer people a place to come and relax without all the hype that so often comes with a New Year’s Eve Party. So you can walk the dog, come by and sit by the roaring fire with a glass of red and let someone else cook dinner, a very chilled way to see in 2019”. Sounds like utter perfection to me. I’m thrilled to be able to call The White Horse my local. It’s just a shame I live a few hundred metres away … as a result, I haven’t quite persuaded Mr W to take me there for an overnight stay yet. I can think of a hundred reasons to visit our beautiful market town and the enchanting surrounding countryside. The White Horse is an odds-on favourite for the top spot. (I know. Shocking. I just couldn’t resist).